Keywords: Visiting Routine, Elderly Posyandu, Knowledge, Payung Sekaki Municipal Health Center Pekanbaru. Posyandu elderly is integrated service kanggo general public wis agreed, sing dikendakan dening ngendi people they can get health services. 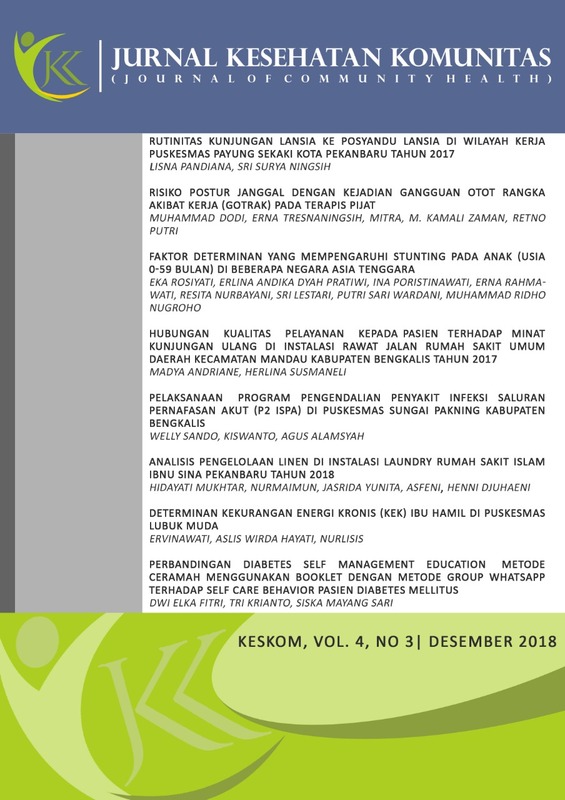 In Indonesia based on Health Facilities Research (Rifaskes) in 2011 the national kanthi percentage of pus nenwsh health center posyandu elderly yaiku 78.8%. The number of posyandu elderly in the city of Pekanbaru yaiku 92 posyandu elder saka 20 puskesmas sing ana ing Pekanbaru city. The purpose of this research is to know the factors related to routine visit of elderly to posyandu elderly that is knowledge factor, attitude, family support, role of health worker, role of cadre, work, education and age. The type of research used is quantitative analytic observasional. The research design used was analytic cross sectional study. The population is all elderly in working area of health center of sekas kota Pekanbaru with sample of 210 people. The results showed that low knowledge had 4 times more risk to not regularly visit to posyandu elderly. The results showed that low knowledge had 4 times more risk to not regularly visit to posyandu elderly. The conclusion in this research is there is a causal relationship between knowledge with routine visit of elderly to posyandu elderly. It is recommended that the elderly improve the knowledge of posyandu elderly and the benefits of visiting elderly parachute services and suggested to Payung Sekaki Health Center Pekanbaru to provide counseling and socialization about posyandu elderly to elderly people.